Lots of programs like to use overlay icons over top the windows folder icons. They use these icons to give the user information at a quick glance. Like if a file has been backed up or synced. But the problem is windows only allows for 15 overlays. On top of that Windows uses some of these up for things like OneDrive. So as things get installed the overlays you care about may stop working as they are replaced with other ones. This happens to me from time to time with the TortoiseSVN icons and the Box Drive icons. But there is an easy fix! 2. There you will find a list that looks something like this. The first 15 items in that list will work and anything after that will be ignored by Windows. 3. Delete the things you don’t want in the list or rename them to add spaces to the front of their name. Then the items with spaces will sort to the top of the list. 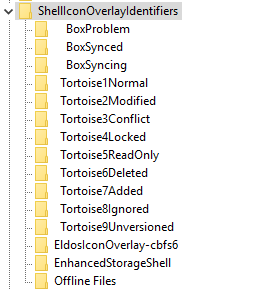 For me, my TortoiseSVN icons stopped working so I deleted a bunch of Box icons I did not care about. 4. After that restart your computer. When it boots back up the icons you want to see should work. The overlay icons are cool but I have no clue why there is a limit of 15. I wish Microsoft would change that. But until then at least there is an easy fix. Unless you want more then 15 icons. If that is the case then you are out of luck for now.